This week (10th – 17th October) is National Hate Crime Awareness week, this occurs annually in order to raise awareness and address what hate crime is, as well as how to respond to it. Through making people more aware of hate crime, we can encourage more people to report it, to promote local support services and resources, and further encourage local authorities to work together with communities and local groups to host Hate Crime Awareness Events throughout the UK and abroad. Hate Crime is a crime that the victim or any other individual perceives to be motivated or a result of hostility or prejudice towards any aspect of a person’s identity. If you have been a victim of Hate Crime or have witnessed someone else be a victim then you should report this immediately. Find out all the information regarding reporting a hate crime, depending on the nature of the hate crime and where it was experienced or witnessed. This week as part of Stop Hate UK’s commitment to National Hate Crime Awareness Week they have extended the existing helpline service, 0800 138 1625, to anyone in the UK who experiences or witnesses hate Crime. The lines opened at 6pm on 10th October and will stay open for anyone, wherever they live in the UK until 6pm on the 17th October. If it is an emergency, do not hesitate to call the Police on 999. 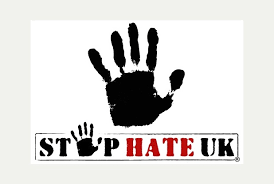 Stop Hate UK is one of the leading national organisations working to challenge all forms of Hate Crime and discrimination, based on any aspect of an individual’s identity. They provide independent, confidential and accessible reporting and support for victims, witnesses and third parties. To find out more you can access their website , which provides you with all the necessary information regarding what hate Crime is, how it report it, as well as how to get involved and volunteer. If you want to discuss anything related to Hate Crime or any other matter, our Counselling, Health and Wellbeing Service are located at 50 Park Place. We are here to help you with any problem, regardless of how big or small you feel the problem might be. We have friendly and approachable staff who are able to listen to you non-judgmentally, in a safe and confidential space. Please access our drop-in from Monday-Friday 3-3:45pm for a 10-15 non-bookable appointment to have an initial chat with us or, alternatively, please refer into our service by completing our referral questionnaire.